← Motorists are responsible for most cycle-car collisions in London – what can people on bikes do to protect themselves? Time and time again in discussions of walking, cycling and public transport infrastructure I hear the argument that ‘we don’t have space’ to allow for these modes because we have to provide for cars – but does this argument stand up to scrutiny? This picture isn’t without its issues – for example it assumes one person per car, and full occupancy for the bus. Typical occupancies for cars are 1.6 overall and 1.2 for commuting journeys. The time that space is most critical is at peak times, i.e. when the majority of traffic is people commuting. 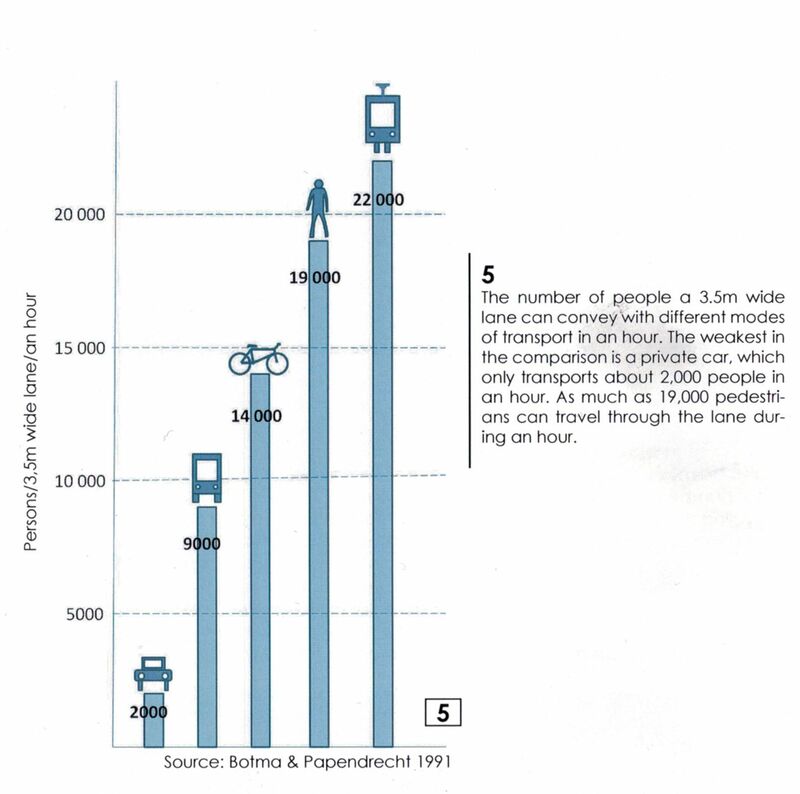 Let’s assume (generously) that we can squeeze the number of cars down by 1/3 by fitting in 1.5 people per car. They’re still taking up a lot more space than 60 bicycles and way more than one bus. Of course, one person per bus would not be a better use of space than one person per car; clearly. But there are also other factors at play here – space taken up is one factor affecting congestion, but it’s clear that smooth flow of traffic and speed of movement are also important. So we’ll have to dig out some traffic count data to get the full picture (sorry!). 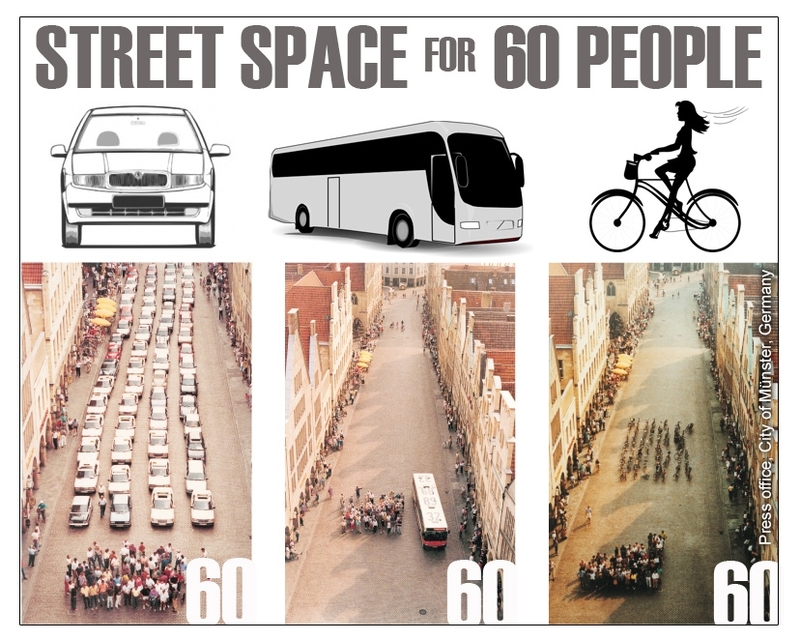 This makes it pretty clear – the photo is, roughly, representative – if you have a limited amount of space to fit a critical number of people through in a limited time, you should prioritise trams and light rail, walking, then cycling, then buses; and your last port of call should be the private motor car (at nearly 10 times less space efficient than walking). I argue that cycling is the one mode of transport that we generally don’t provide for in any meaningful way in the UK – most people feel it is not possible for them to cycle, because of how hostile roads feel. It is here that there is the greatest unmet demand. It’s also incredibly cheap compared to other ways of moving people around and provides paybacks in the region of 40:1; 4:1 just from the health benefits. It is here that we should focus our efforts in the short term. Not only will investing in cycling, and to a lesser extent, walking and public transport mean that more people can move around, but it means that those who have longer journeys to make who can’t possibly walk, cycle or take the bus will benefit too – this is backed up by data from TomTom who ranked the most congested cities – all the top 5 had less than 2% of trips done by bicycle, and data from New York which suggests that even when segregated cycle lanes take away space from cars that they increase traffic speeds. That’s right, building cycle infrastructure is what’s best for those people who will never travel by any other way than driving too; as well as what’s best for people who cycle, pedestrians and everyone in the town or city (from less noise, less pollution, less road danger). Less people driving means faster journeys for drivers, users of public transport, pedestrians and cyclists. It’s not a zero sum game where we take from one and give to another – everyone wins from cycling, even those that won’t ever cycle. The argument that says that where we have a limited resource (in this case, space) that we should prioritise use of it for the least efficient use of that resource (cars) is fundamentally flawed. Let’s end the nonsense of using it to prevent the implementation of decent quality walking and cycling infrastructure and the closing of bus lanes. Let’s allow people to walk, cycle and take public transport for more journeys if they want to, by making it quicker, easier and safer to do so – saving money for individuals and vast amounts for government. Let’s allow those people who need to, to drive on less congested streets. Yes, that means some short term pain as we take back space from the motor car – there will be increased congestion in the short term in certain places; but in the longer term, behaviour will change as we grow comprehensive networks for walking, cycling and public transport and within the first year or so of this kind of effort, the congestion will decrease, freeing up more road space for more ambitious walking, cycling and public transport projects. Everyone will end up a winner; why would you not? What’s the impact on total CO2 emissions of electric cars or – are they really fossil fuelled? What’s the real UK death toll from inactivity? Part two – how many?